Over the past decade we’ve seen an unprecedented explosion in the use of the cloud. Today, you can do just about anything via the web, from ordering a car to submitting an expense report, from your personal life to your work life. These cloud solutions have a myriad of advantages – they are easy to sign up for, fast to use, and work well on mobile devices. However, one difficulty is each service operates in its own silo – if you have to do something that requires using more than one service, it will be challenging to get data from one of them to the other. That’s where Microsoft Flow comes in. Microsoft Flow makes it easy to mash-up two or more different services. 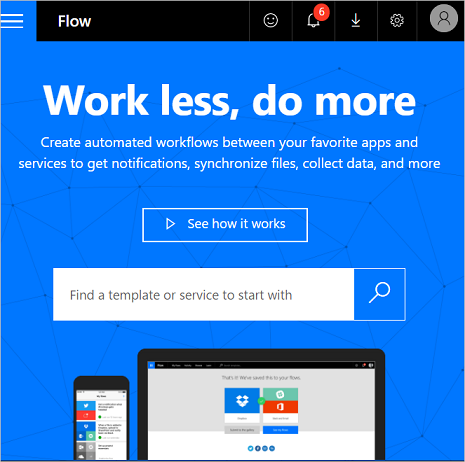 Today, Microsoft Flow is publicly available as a preview, at no cost. We have connections to 35+ different services, including both Microsoft services like OneDrive and SharePoint, and public software services like Slack, Twitter and Salesforce.com, with more being added every week. You can now go to https://flow.microsoft.com/ and sign up with a work or school account. My name is Stephen Siciliano and I’m the Group Program Manager for Microsoft Flow. I’ve had the privilege of using it for the past few months and it’s made my life at work much easier. There are several different ways I use it: to get notifications when important things happen, to organize data from Twitter, to synchronize files, and to handle approvals. 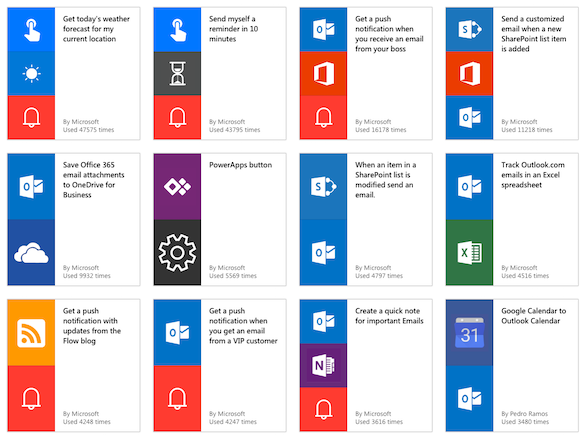 Each of these templates and dozens more are available today in Microsoft Flow. Start with this blog post to read about how to sign up and get started with a template. My manager emails me a lot, but with all the email I get, it’s easy to miss an important message. Luckily, it’s very easy to create a flow that sends me a text message whenever my boss sends me an email. Check out this blog post on how to set this up. My friends will tell you I’m not very adept at social media, so to help me keep on top of it I’m integrating tweets with a tool I am familiar with (Excel). I have a flow set up that searches for tweets about Microsoft Flow and saves them into an Excel file that I can review on my own time. You can even save tweets to SQL, as covered in this blog post. I use OneDrvie for Business to store my files, but sometimes I want to easily get the files to SharePoint so my colleagues can see them. I was able to create a flow that copies files from a OneDrive for Business folder up to my team's SharePoint site. We have been working on some blog posts to help you understand and get started with flow, and even to debug them, and we wanted to be sure that all of the posts were reviewed and approved. We created a simple approval workflow that asks me if the blog is ready, and if it is the flow copies it to a folder called Final. This is just the start of the journey for us. In the coming weeks and months, you will see us releasing new features on a weekly basis. One of the areas I’m particularly excited about coming soon is making Microsoft Flow work well in large companies so you can share content within an organization and even connect to on-premises data sources. Check out our documentation that covers topics from getting starting to building more advanced approval flows. Join our community today and share what you’re doing, ask questions or even submit new ideas. Reach out to us on Twitter.